Candidates can read official notification. before applying for these posts. Online application Forms already started from 11th October 2018. Candidates can fill application form till 9th November 2018. Further details like important dates, eligibility criteria. application fee, selection process, age limit, pay scale, how to apply etc. is given below. Educational Qualification :- Candidates who are going to apply for this DLW Apprentice 2018 Application Form, they must posses following qualifications. ITI in relevant field from recognized board. Age Limit :- Candidate’s age should between 15 to 22 years for Non ITI and 15 to 24 for ITI holders. Pay Scale :- Selected applicant for this DLW Apprentice Vacancies, they will get pay scale according to Central Govt. allowances. Recruitment authority board have decided selection process is given below. Application fee: Candidate will have to pay application fee of Rs. 100/- for all the candidates. How to apply for DLW Recruitment 2018 ? 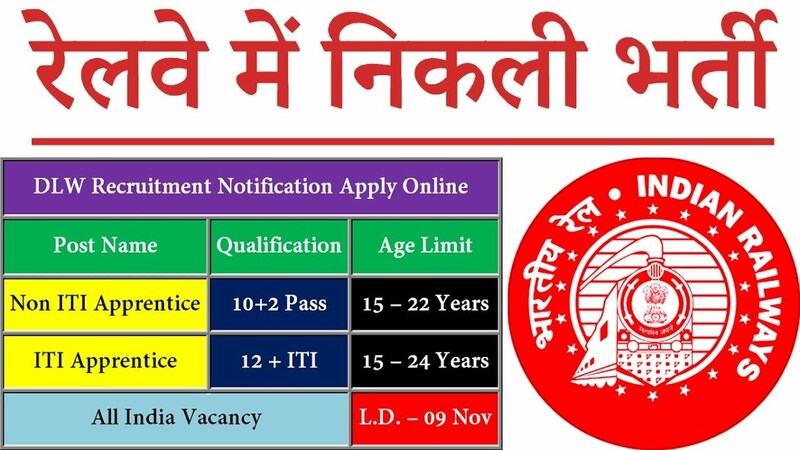 Look around for DLW Recruitment 2018 for 374 ITI / Non-ITI Apprentice Vacancies.